In 1999 Holden introduced the 5.7 litre LS1 engine and since then even bigger versions such as 6.0 litre and 6.2 litre engines, and some people have imported or built 7.0 litre engines. Fords followed suit, as well as Chrysler Jeep. Therefore, what was written below in part, has been superseded and is outdated. Modern V6 engines have more power than the V8 in a VB – VR Commodore, and the new V8’s standard have more power than the older V8’s even after $20k had been spent on it, and they use far less fuel. The 5.7 litre LS1 engine was powerful, but doggy down low. Going too big on the exhaust and extractors meant they used excessive fuel, made lots of noise and droned. Diff gears helped, but often this would increase fuel consumption as well. One these engines, we believe tri-y extractors were the best all round compromise for a street car, especially if it frequented shopping centres with speed humps. For a ¼ mile car or for dyno numbers, 4>1 are better, but you need more revs to launch, they use more fuel, and they hang lower, which isn’t ideal on lowered cars. The 6.0 litre engine is totally different, has plenty of power down low, and is not doggy. On the VE – VF we recommend the 1-7/8” 4>1 extractors, which increase power and torque right through the rev range. The Sureflo Ballistic extractors are tight to the engine, and combined with the 5” body Ballistic 100cpsi racing cats, they increase performance and torque, and sit up nice and high (unlike some other brands). These are better than cast manifolds as the pipes are longer and offer better flow. They do not hold as much heat as the cast manifolds, which helps to keep under bonnet temperatures down. Block Huggers are a typical example of this type. Headers are often fitted during production of many new cars as they are easy to fit and offer better performance than cast manifolds. The disadvantages are: unequal tube lengths, and very restrictive - especially in the collector. This design consists of 4 pipes collecting into 2, then collecting into 1 pipe. This types gives good power gains and very good torque in the low to mid range. This means plenty of "off the line" power as well as overtaking power. This type is particularly suited to street cars where acceleration is important. As described this type consists of 4 long pipes usually 32" to 36" long collected into 1 pipe. Good sets are also collected in firing order which creates an exhaust pulse which helps the scavenging effect. 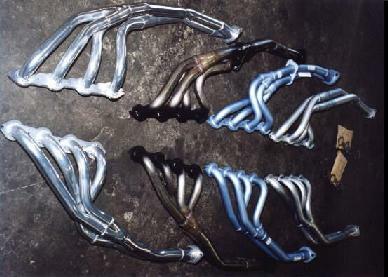 These pipes offer superior top end power and are suited to highly modified engines and cars fitted with superchargers. The bigger the diameter of the pipe and the shorter the pipe the better it is for top end figures and high revving power. Smaller diameter pipes with longer length primaries bring the usable power in down low. With Gen 3 Commodores there are Short 4 into 1 Extractors as well as Long 4 into 1 Extractors. The long 4 into 1 extractors are already available in 1½", 1 5/8" and 1¾" pipe sizes and soon 1 7/8" will be available. So if you own a Gen 3 Commodore, no matter what modifications you have and where you want your power, there will be a set to suit your car. One disadvantage is that the bundle of 4 pipes comes close to things that don't like heat and hang low on some vehicles. XW-XY Ford's are prone to scaping the bottom of the extractors on speed humps. Genie, Pacemaker, Hi-Tech, Advance, Wildcat, Motorvator, Hurricane & Boss. 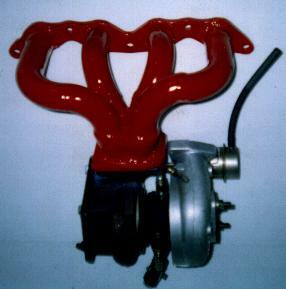 We also custom make extractors and Turbo Manifolds when the need arises. HPC (Ceramic Coating) cuts the under bonnet temperatures by half, stops the pipes from rusting and cuts down on friction. The choice of extractors is influenced by: quality, performance, fitment, appearance, warranty and budget. So which one suits your application and budget? Mandrel Bent ? Press Bent ? or a combination of both ? Zinc Passivate ? or High Performance Coating ? Mild Steel or Stainless Steel ? If you have a V6 or V8 motor, on top of performance you must look at ease of fitment, length of warranty, and reliability. If they take 6-8 hours to fit it is imperative that you choose a good quality, reliable set, that fits. We can guide you through these decisions. Extractors typically increase power and torque by 10-15%. This also translates into better fuel economy greater acceleration for overtaking, and more torque for towing and up hill pulling power. Custom extractors being made for a new truck. We made this set of custom tuned extractors for a V6 Peugeot Rally car. They were then HPC Coated and fitted to the car. The owner was rapt in the extra performance displayed by his car. Faster revving, more torque and increased acceleration.